Ergodyne ProFlex 821 2X Black Silicone Handler Gloves with textured silicone palm and fingers offers enhanced abrasion resistance. 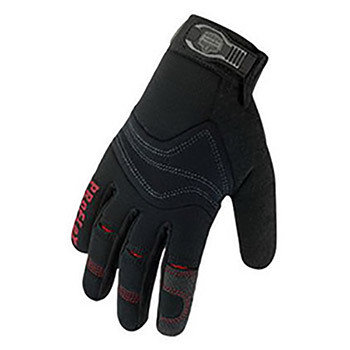 Gloves features three layer stretch breathable spandex back with neoprene knuckle pad for added ventilation with comfort. Woven elastic cuff gloves with low profile closure and pull tab renders easy and quick on and off. Full finger pattern gloves with terry thumb brow wipe find application in fabrication, glass handling, packing, warehousing and in dry grip applications.